Sandy Beach Oahu: Beautiful and Dangerous. 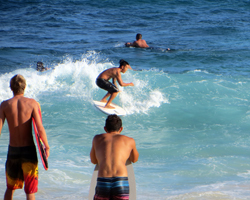 Sandy Beach Oahu: Beautiful, Exhilarating & Dangerous! Body surfing (or body boarding) at Sandy Beach Oahu is the best chance you’ll ever have at riding inside a Hawaiian “tube” wave. It’s also the best chance you’ll ever have at breaking your neck if you have no idea what you’re doing, so exercise some critical judgment about your abilities before you attempt this. Almost every single wave in the shore break at Sandy Beach Oahu forms a nearly perfect tube before crashing into the sand with enough force to knock even the strongest bystander off his feet! I’ve ridden hundreds of such waves here. The experience of even short tube rides such as these is thrilling! Yet even though I knew what I was doing, I’ve been slammed into the sand pretty hard as well (more than a few times). Not surprisingly, this beach tends to be most popular with the high school and young adult demographics. 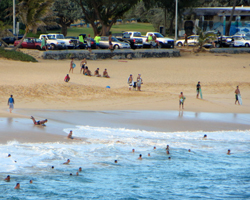 When I was in high school, I used to go to Sandy Beach – or “Sandys” as it is often called for short – every weekend. And as a result, I had residual sand in my ears and hair and who knows where else for just about every day of my teenaged life. You’d be amazed where sand turns up a week after you’ve been in the water at Sandys! Needless to say, parents of young children and anyone looking for a calm soak should probably never consider going to Sandys. The shore break is just too rough. Due to consistently strong breezes, Sandy Beach Park is an excellent place to fly kites. Go on a weekend, and you’ll be astonished by the size and variety of kites flown by hobbyists. 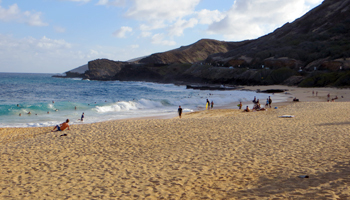 Furthermore, the beach itself is wide and beautiful – and they don’t call it Sandy Beach Oahu without reason! If you’re just looking sunbathe or play in the sand, this beach is fantastic! In fact, the chances of having an idyllic sunny day here are probably higher than almost everywhere else on the island because Sandys is located in one of the driest parts of Oahu. Finally, from the beach, you can also get a great view of the Halona Blowhole. I can’t stress enough just how strong the shore break is at Sandy Beach Oahu; but here’s a visual. I’ve had my snapped-and-tied swim trunks literally ripped part-way off. So ladies, I’ll give you the same advice I give all my female friends who go there… wear a one-piece suit. If you insist on wearing a bikini, one part of it is virtually guaranteed to get ripped off by the waves. I’ve seen this happen a lot more times than I’ve had my own shorts removed. And guys, here’s a tip for you: some ladies will ignore my previous tip. Disclaimer: No matter how I describe these beaches, stupidity and carelessness can still kill you. Use your brain and take responsibility for your own safety. Know the limits of your ability and stay within them. Watch your kids like a hawk. Heed posted warning signs. Never turn your back to the waves. Use your sunscreen. Don’t feed the birds. Stay on or off the grass (whichever you prefer). Then you’ll have a great day, and live to tell about it.